There are many things a metal roof can resist; fire, extreme weather, winds, wild animals, and aging. But metal roofs are prone to corrosion, which is a natural process where moisture and chemical reactions cause oxidation and damage the roofs. Especially in areas where there is heavy rainfall or atmospheric moisture, and the roofs are exposed to that moisture for a long period of time. Corrosion and rust adversely affect the lifespan of metal roofs.It can cause shingles to break and fall, induce leakage, and accumulation of debris. All metals corrode, and there are many different types of corrosion. 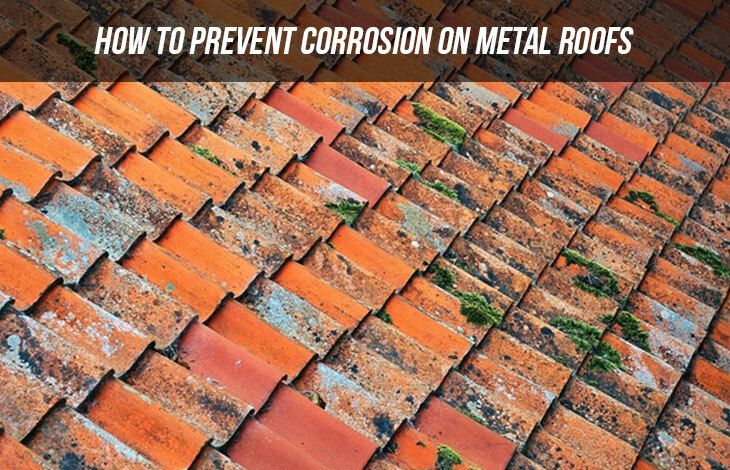 In order to be able to prevent and treat your roof, you need to have knowledge about the different types of corrosion. Rust;causes red, orange, or black bumpy patches on a metal roof. The main reason behind rust is the oxidization of metal due to heavy atmospheric moisture and water retention. Caustic Agent Corrosion; caused by the break down of metallic material by impure liquids and gases. Galvanic Corrosion; caused by the decay of one metal when it comes into electrical contact with another metal in the company of an electrolyte. General Attack Corrosion; when two metals, cathode,and anode, come into close contact with each other. Flow Accelerated Corrosion; occurs due to wind and rain exposure. Stress Corrosion Cracking; mainly takes place in buildings where dance halls and gym are located, which cause extra tensile stress on a roof. 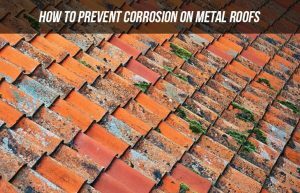 Let’s go over the prevention measures in order to protect your roof against all sorts of corrosion. You may talk to your contractor beforehand and discuss what services they offer to prevent corrosion. Paint offers major protection against roof corrosion. Painting your roof with a primer that contains eighty percent zinc is an excellent measure for prevention of rust. It is important to clean your roof and completely remove all signs of debris and dirt before you start painting it. You must paint your roof every three years to avoid corrosion. Elastomeric coatings are tried and tested methods to prevent roof corrosion. It is an acrylic sealing system which is applied in layers and causes an effective barrier between the roof and exposure to corrosion. Just like paint, it is important to clean your roof well before an elastomeric coating. A single layer of this coating lasts up to five years. As we’ve discussed before how zinc is an excellent protectant against corrosion, how about you treat your roof with liquified zinc? That is what galvanized roofing is all about. The zinc forms a protective layer on your roof and further strengthens it. Your roof will sit perfectly well under the layer of zinc for years! There are many different options to choose from; zinc, iron, aluminum, copper, steel, and tin. All metals react in a different way when exposed to water, moisture, acids, and other metals. Prior to roof installation, ask your contractor to discuss with you the suitable material for your roof, keeping in mind the weather conditions. Roof hygiene is a significant part of prevention measures against corrosion. The lifespan of your roof largely depends on how closely and carefully you carry out roof inspections and detailed cleaning. A proper understanding of the pit falls of corrosion on metal roofs will allow you to have an edge on a suitable selection of the kind of metal roof to choose and which course of roof maintenance to take. You can always talk to your service provider for more custom information on how to prevent corrosion on your roof.